Established environmental and economic policies focused on efficiency improvements are necessary contributions to achieving the 2050 vision of living well within the limits of the planet but are unlikely to be sufficient in themselves. The transition to a green economy is a long-term, multi-dimensional and fundamental process that will require a move away from the current linear economic model of 'take-make-consume-dispose' which relies on large quantities of easily accessible resources and energy. This will necessitate profound changes in dominant institutions, practises, technologies, policies, lifestyles and thinking. The transition to a green economy will involve reconciling the longer-term perspective of environmental policies with the relatively short-term focus of economic and social policies. With some justification, decision makers give issues such as tackling unemployment and dealing with social inequalities greater emphasis as society expects immediate action and results. Less emphasis is given to longer-term actions that deliver less immediate and visible benefits, such as actions to restore ecosystem resilience. These different time scales pose a further challenge since achieving long-term visions and objectives crucially depends on short- and medium-term actions and investments. In terms of policy, the EU needs to ensure that its targets and objectives in the 2020–2030 timeframe provide a viable pathway to realising the 2050 vision (see Figure 1.1). The recently adopted 7th Environment Action Programme provides a coherent, systemic framework to broaden societal efforts towards these goals. It commits the EU to 'stimulate the transition to a green economy and to strive towards an absolute decoupling of economic growth and environmental degradation' with the 2050 vision 'intended to guide action up to 2020 and beyond' (EU, 2013). In current environment and climate policy, there are four prevailing, interrelated and complementary policy approaches that could be recalibrated to support a transition to a green economy. 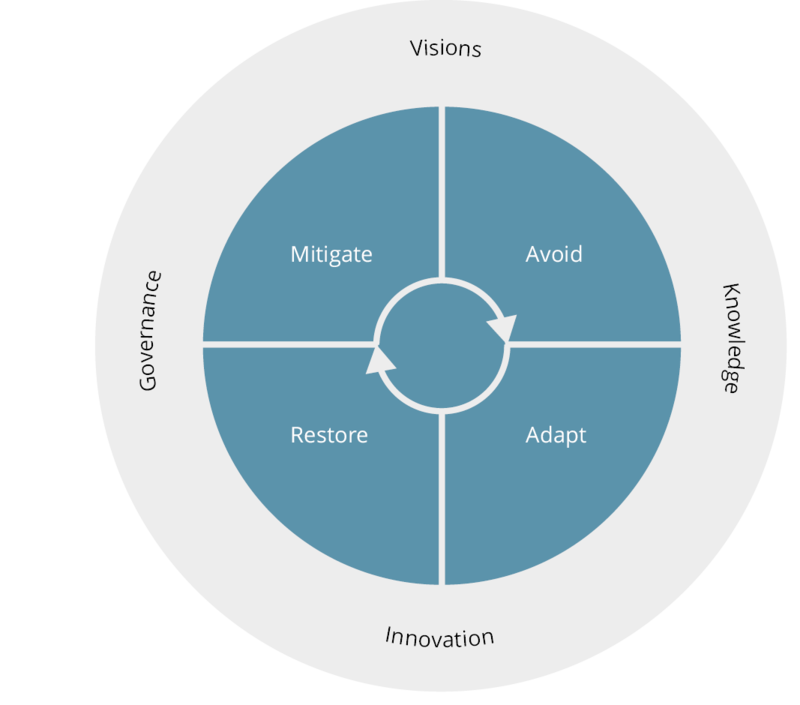 These four approaches can be summarised as: mitigate, adapt, avoid and restore. Each approach depends on different types of knowledge and governance arrangements and creates varying innovation needs. Considering these four approaches together in terms of existing policy implementation and future policy design, could help accelerate a transition towards a green economy (Figure 7.1). Mitigate: Policies that mitigate environmental degradation focus on reducing environmental pressures or offsetting the harmful effects of resource use on people's health and ecosystems. They have been the dominant response in Europe since the 1970s and are efficient in addressing both 'specific' and 'diffuse' environmental challenges (Table 1.1). For example, regulations and economic instruments have abated pollution from known, stable sources and have improved resource efficiency by incentivising the development and uptake of cleaner technologies. Table 6.1 indicates several success stories. If they are well designed, mitigation policies can benefit socio-economic objectives. For example, shifting taxes from employment towards resource use and pollution offers a way to offset the impact of shrinking workforces in coming decades, while also incentivising resource efficiency improvements. Environmental taxation is an underused policy instrument: revenues in the EU from these taxes fell from 2.7% to 2.4% of GDP between 1995 and 2012. Strengthening pollution abatement standards — most notably in the air pollution, climate, waste and water sectors — would likewise provide incentives for further research, technological innovation and trade in goods and services. Adapt: Policies focused on adapting recognise that some environmental change is inevitable. These policies focus on how to anticipate the adverse effects of specific environmental changes and take action to prevent or minimise the damage they can cause. While this approach (and the term 'adaptation') is most often used in a climate change context, the core principles of such policies span most economic and social policy domains. Policies aimed at adapting are highly relevant to areas such as biodiversity and nature protection; food, water and energy security; and managing the environment-related health implications of population ageing. Regional ecosystem-based management approaches (see Chapter 3) are an example of an adaptive approach which aims to use natural resources to secure the resilience of ecosystems and their services to society. Avoid: Policies based on the precautionary principle, can help to avoid potential harm (or counter-productive actions) in highly complex and uncertain situations. The speed and scale of current technological developments often outstrips society's capacities to monitor and respond to risks before they become widespread. An EEA assessment of 34 cases where early warnings of risk were ignored argues that precautionary action could have saved many lives and avoided extensive damage to ecosystems. The assessment covered a variety of cases, including chemicals, pharmaceuticals, nano- and biotechnologies and radiation (EEA, 2013k). The precautionary principle also brings opportunities for broader societal engagement on future innovation pathways. It provides a platform for more integrated risk governance and debate on questions such as the strength of evidence for action, the burden of proof and the trade-offs that society is willing to make against other objectives and priorities. This is especially relevant for emerging technologies, such as nanotechnologies, where the risks and benefits to society are both uncertain and contested. Restore: Policies that aim to restore focus on remediating environmental degradation (where possible) or other costs imposed on society. They are used across most environmental domains and in economic and social policy areas. Societal actions focused on restoration can be used to improve ecosystem resilience, bringing multiple benefits to human health and well-being. They can also enable social and environmental goals to be pursued simultaneously. For example, investment in green infrastructure can address ecosystem resilience and increase access to green spaces. Restoring can also include offsetting the regressive effects of environmental policies. For example, measures to reduce greenhouse gas emissions can increase energy bills, disproportionally affecting low income households (EEA, 2011b). In response, policy measures aimed at restoring resilience would focus on distributional issues and improving energy efficiency. The four policy approaches (mitigate, adapt, avoid and restore) are anchored by the four environment principles of the Treaty on European Union: polluter pays, prevention, precaution and rectification of damage at source. These approaches can be combined in several ways. For example, the principle of preventing environmental degradation involves the use of measures to mitigate and avoid problems, whereas dealing with the consequences involves the use of measures to adapt and restore. Fixing known problems can be supported by a combination of measures to mitigate and restore, whereas anticipating more uncertain, future problems would involve measures to avoid and adapt. Striking the appropriate balances between these approaches while harnessing synergies through integrated implementation can shape the benefits that society could secure in coming decades. Policy packages that include objectives and targets explicitly recognising the relationships between resource efficiency, ecosystem resilience and human well-being, as well as the different time and space dimensions involved, would enhance integration and coherence and help to accelerate transitions. New governance approaches have emerged in recent decades in response to the increasingly long-term and globalised environmental challenges. The primary governance response has been international agreements or the pooling of sovereignty in regional blocs, such as in the European Union. More recently, the limitations of intergovernmental processes at the global scale and the new opportunities created by technological and social innovations have driven more participatory network governance approaches, based on informal institutions and instruments. This in turn has driven increasing demands for transparency and accountability from governments and businesses. The goals of non-governmental organisations have shifted in recent years from primarily aiming to steer government and intergovernmental processes, to also include development of environmental standards and monitoring trends (Cole, 2011). Crucially, businesses often have a commercial interest in the adoption of production standards that frequently underlie mitigation policies. In this respect, network governance approaches can help align the interests of different stakeholders — with non-governmental organisations proposing standards and businesses promoting them (Cashore and Stone, 2012). For example, certification and labelling schemes enable firms to signal good practices to consumers as well as differentiate their products from those of competitors. Such approaches today help address known environmental problems, such as forest degradation, ecosystem fragmentation and pollution (Ecolabel Index, 2014) as well as issues where cause-effect relationships are less clear e.g. people's exposures to chemicals in consumer products. In other situations, businesses favour harmonised mitigation standards in order to reduce production costs or to enable a 'level playing field' with competitors. The ongoing adoption across Asia, for example, of EU emissions standards for road vehicles illustrates both the desire for greater efficiencies in global production as well as the different roles and interactions between actors in environmental governance. The rise of networks is also opening up opportunities at local level. As emphasised in Objective 8 of the 7th Environment Action Programme, cities and their networks have a particularly important role in environmental governance (see Box 1.1). Cities concentrate populations, economic and social activities and innovations of all sorts and so can be a laboratory for the integrated implementation of the four approaches outlined in Section 7.2. Enhanced networking of cities, as illustrated by the Covenant of Mayors (CM, 2014) can further multiply benefits by supporting the upscaling and diffusion of niche innovations to contribute to broader systemic change. The 7th Environment Action Programme identifies four key pillars of an enabling framework for transition to a green economy: implementation, integration, information and investments. The first two of these feature prominently in Chapters 3–5 and Table 6.1 as well as the approaches considered in Section 7.2. Effective implementation of horizontal instruments that focus on integration such as the Strategic Environmental Assessment Directive and Environmental Impact Assessment Directive, could play a stronger role in the context of long-term transitions. A third pillar, 'information', runs through the whole report and is addressed further in Section 7.5. The fourth pillar relates to investments. Investment choices — and the availability of financial resources more broadly — are key enabling conditions for long-term transitions. This is partly because the systems that meet basic social needs such as water, energy and mobility rely on costly and long-lasting infrastructure. Investment choices can therefore have long-term implications for the functioning of these systems and their impacts, as well as for the viability of alternative technologies. Transitions thus depend in part on avoiding investments that lock in existing technologies, limit options, or hinder the development of substitutes. The estimated financial needs for investments in green economy infrastructure and innovations at the European and global scales are enormous. Realising a low-carbon future in the EU is estimated to require EUR 270 billion annually for 40 years (EC, 2011a). There are opportunities to direct financial resources to support transitions through a number of channels. Some of these channels are public and include specific initiatives undertaken by EU financial institutions. Phasing out environmentally harmful subsidies that distort price signals can also influence investment choices and release public revenue for investment. Other channels, for example pension funds, are to be found in the private sector. Some, such as sovereign wealth funds, mix public and private elements. As for the instruments these channels can invest in, there is great potential in hybrid instruments, including green bonds (EEA, 2014s). There is increasing interest in sustainable and responsible investment strategies with funds continuing to grow in recent years (Eurosif, 2014). At the EU level, support for the green economy can be found in the EU's Multiannual Financial Framework 2014–2020, which provides for the investment of nearly EUR 1 trillion in sustainable growth, jobs, and competitiveness, in line with the Europe 2020 Strategy. At least 20% of the EU's 2014–2020 budget will be spent on transforming Europe into a clean and competitive low-carbon economy, using policies covering structural funds, research, agriculture, maritime policy, fisheries, and the LIFE programme. Investments can also support the emergence and upscaling of niche economic, technological and social innovations that enable society to meet its needs in less harmful ways (Box 7.1). Investment in research and innovation has an important role, as does investment in facilitating the diffusion of new technologies and approaches. The EU's Framework Programme for Research and Innovation (Horizon 2020) has a primary focus on fostering innovation, and technological innovations in particular. It also addresses social innovation through several 'societal challenges', of which Societal Challenge 5 on climate action, environment, resource efficiency and raw materials, is of particular relevance. As part of the preparation of this SOER 2015 Synthesis report, the EEA convened a group of 25 stakeholders from science, business, policy and civil society to reflect on the prospects for the environment in Europe. During those discussions, the participants identified four clusters of innovations with potential to support transitions in the systems that provide Europe's food, mobility and energy. Collaborative consumption focuses on the ways that consumers can obtain products or services more effectively and resource-efficiently. This may involve fundamentally changing the ways that consumer demands are met, including shifting from individual decisions to organised or collective demand. Prosumerism reduces the distinction between producer and consumer and can be seen as a particular type of collaborative consumption. An example is distributed energy production systems, enabled by technological innovations such as smart metering and smart grids. Social innovation entails developing new concepts, strategies and organisational forms to better meet societal needs. Both examples above are examples of social innovation, with prosumerism a social innovation that is enabled in part by technological innovation. Social innovation is a problem solving approach that carries strong potential for generating new social relationships, and is perhaps the most crucial element required for fostering sustainability transitions. Eco-innovation and eco-design go further than technological innovation, to incorporate environmental considerations by either reducing the environmental impact of products or production processes, or incorporating environmental concerns into the product design and life cycle. Harvesting energy from food waste, multi-trophic agriculture, and retrofit building insulation from recycled paper products are just a few examples of eco-innovation and design. The EU is explicitly committed to modernising its industrial base by accelerating the uptake of technological innovation. It has adopted a policy objective of reaching a 20% share of manufacturing industry in EU GDP by 2020. If eco-innovative solutions are pursued, this objective provides an opportunity to reconcile economic, employment, environment and climate objectives. Alongside investments in new technologies, there is also a need for spending aimed at identifying, assessing, managing and communicating the risks that can accompany innovation. Historically, EU-funded public research has allocated less than 2% of funding to investigate potential health hazards of new technologies. Ratios of 5–15% would seem more prudent, depending on the relative novelty of the technology, and on its potential persistence, bioaccumulation and spatial ranges (Hansen and Gee, 2014). Finally, fiscal measures have an important role in steering and incentivising investment. Eco-innovations can face difficulties competing with established technologies because market prices seldom reflect the full environmental and social costs of resource use. By adjusting prices, tax reforms can correct market incentives, as well as generating revenues that can be invested in eco-innovations. Reform of environmentally harmful subsidies is important, notably in the areas of agriculture and energy. For example, despite growing interest in promoting renewable energy, in 2012 Europe's fossil fuel and nuclear sectors still benefited from a significant number of support measures, adversely affecting public budgets in times of crisis (EEA, 2014e) . Expanding the environmental knowledge base can secure many goals. These include supporting better implementation and integration of environment and climate policy; informing investment choices, and supporting long-term transitions. An expanded knowledge base also ensures that policymakers and businesses have a sound basis for taking decisions that fully reflect environmental limits, risks, uncertainties, benefits and costs. The current knowledge base for environmental policy is based on monitoring, data, indicators and assessments mainly linked to the implementation of legislation, formal scientific research and 'citizen science' initiatives. However, there are gaps between the available knowledge and that required to meet emerging policy demands. These gaps call for actions to widen the knowledge base for policy and decision-making in the coming decade. Knowledge gaps are highlighted throughout this report. Gaps that merit particular attention relate to systems science; complex environmental change and systemic risks; how Europe's environment is affected by global megatrends; the interplay between socio-economic and environmental factors; feasible transitions in production-consumption systems; environmental risks to health; and the inter-relationships between economic development, environmental change and human well-being. In addition, there are areas where knowledge development can support both policymaking and investment decisions, namely integrated environmental-economic accounts and derived indicators. This includes physical and monetary accounts for natural capital and ecosystem services and developing and applying indicators to complement and go beyond GDP. The inclusion of long-term perspectives to support policy and decision-making raises further issues. Long-term environmental policy objectives have only explicitly been established in a few areas and new policies will require more information on possible future developments and choices in the face of greater risks and uncertainties. Such investments can have secondary benefits with respect to the better management of current policies. Foresight methods such as horizon scanning, model-based projections and scenario development should be more widely used to enhance strategic planning. Forward-looking assessments and their inclusion in regular state of the environment reporting would enable better understanding of future trends and uncertainties, and improve the robustness of policy options and their consequences. Further implementation of the Shared Environmental Information System principle of 'produce once use often', and the use of common approaches and standards (e.g. INSPIRE, Copernicus) can help streamline effort and release resources. Current environmental information systems should also incorporate new information on emerging themes and forward-looking information as knowledge gaps are addressed in the coming years. Strengthening the science-policy-society interfaces and citizen engagement are important elements of transition processes. Effective stakeholder engagement is important for the development of future transition pathways and to improve the confidence of policymakers and the public in the evidence that underpins policy. The new and emerging issues arising from technological changes that outpace policy development have led to public concern. Adopting a systematic and integrated approach to risk management will require broader and more transparent scientific, political and societal debates and strengthen Europe's capacity to identify and upscale niche innovations in support of a transition. As highlighted in Objective 5 of the 7th Environment Action Programme, the EEA has a particular role to play in strengthening the science-policy interface. Along with the European Environment Information and Observation Network (Eionet) it forms a partnership generating two-way quality assured environmental data and information by co-creating and sharing knowledge. The steps identified in the 7th Environment Action Programme provide the foundation for a strategic reflection amongst stakeholders on knowledge development needs and priorities. This also includes consideration of the role and status of different types of knowledge and how they are linked to policymaking and transitions. The shared timeframe of the EU's 7th Environment Action Programme, Multiannual Financial Framework 2014–2020 and the Framework Programme for Research and Innovation (Horizon 2020) offers an opportunity to harness synergies between knowledge development needs and funding mechanisms. This report evaluates the European environment's state, trends and prospects in a global context. It provides a detailed understanding of the systemic characteristics of Europe's environmental challenges and their interdependence with economic and social systems. It analyses opportunities to recalibrate policies, governance, investment and knowledge in line with the 2050 vision of living well within the limits of the planet. The transition to a green economy in Europe involves going beyond economic efficiency and optimisation strategies to embracing society-wide changes. Environment and climate policies have a central role within this wider approach. The 7th Environment Action Programme offers a clear vision and sense of direction. However, success in the short and longer-term requires acknowledgment of the role of sustainability approaches and solutions for dealing with the multiple challenges and systemic risks faced by Europe and the world. The findings set out in this report are complemented by recent outputs from the European Strategy and Policy Analysis System which assessed the long-term political and economic environment facing Europe over the next 20 years, and Europe's policy options for dealing with them (ESPAS, 2012). They emphasised that Europe and the world are experiencing a period of accelerated change, in particular with respect to power, demographics, climate, urbanisation and technology. Tracking these trends and formulating response options will be fundamental to Europe's ability to deal with these challenges that have greater uncertainties as well as offering broader opportunities for system-level change. The findings are also coherent with developments in the business community. For example, the latest assessment of global risks from the World Economic Forum identified three environmental risks among the ten risks of highest concern for business (WEF, 2014). The assessment calls for collaborative stakeholder action; better communication and learning amongst stakeholders; and new ways to incentivise long-term thinking. Individual businesses are also focusing on integrated resource management in a long-term perspective, for example, by evaluating the implications of the food-water-energy nexus for their prospects and developing new types of business models (RGS, 2014). At the global level the Rio+20 conference in 2012 confirmed that the world needs new types of sustainable development policies in order to live within the limits of the planet (UN, 2012a). Better understanding of systemic challenges and their time dimension has in recent years led to the framing of global environmental issues in terms of tipping points, limits, and gaps. In climate change, arguably the most critical, complex and systemic challenge we are facing, these characteristics clearly coincide. The same can be said for ecosystem changes. Overall, societies, economies, finance systems, political ideologies and knowledge systems fail to acknowledge or incorporate seriously the idea of planetary boundaries or limits. The Rio+20 declaration's objectives for a low-carbon society, ecological resilience, green economy, and equity are all intertwined with the core systems that societies depend on for their welfare. Embracing these realities and designing future actions accordingly could make transitions more credible and feasible globally. European citizens strongly believe that the state of the environment influences quality of life and that more needs to be done to protect the environment. They favour action at European level and more prioritisation of EU funding to support environmentally-friendly activities. Europeans also support measuring national progress using environmental, social and economic criteria, and are in widespread agreement that environmental protection and efficient use of natural resources can boost economic growth, create jobs and contribute to social cohesion (EC, 2014b). At the same time this increasingly shared understanding will not suffice. Combining this with an imperative sense of urgency would accelerate the translation of the 2050 visions and ambitions into feasible, but at the same time credible and concrete steps and pathways. This report has come to the conclusion that traditional incremental approaches based on the efficiency approach will not suffice. Rather, unsustainable systems of production and consumption require fundamental rethinking in the light of European and global realities. The overall challenge for the next decades will be to recalibrate mobility, agriculture, energy, urban development, and other core systems of provision in such way that global natural systems maintain their resilience, as the basis for a decent life. The systemic nature of the problems and dynamics identified here necessitates systemic solutions. There are currently a wide range of system lock-ins to be overcome, for example, in the fields of science, technology, finance, fiscal instruments, accounting practices, business models, and research and development. The future governance of transition pathways will need to balance efforts between addressing such lock-ins, while maintaining progress towards achieving short and medium-term goals and targets, and avoiding new lock-ins on the path to 2050 visions to the extent possible. Designing actionable, credible and feasible transition pathways will involve a combination of ingenuity and creativity, courage, and greater shared understanding. Arguably, the most fundamental shift in modern society in the 21st century will be to reinvent what it means to have a high level of societal well-being, while accepting and embracing the limits of the planet. Otherwise there is an increasing risk that breaching tipping points and moving beyond limits might bring more disruptive and unwelcome pushes towards societal change. In its 7th Environment Action Programme, Europe envisions that young children today will live around half their lives in a low-carbon society, based on a circular economy and resilient ecosystems. Achieving this commitment can put Europe at the frontier of science and technology but calls for a greater sense of urgency and more courageous actions. This report offers a knowledge based contribution towards meeting those visions and goals. Climate change and investments Measures to mitigate and adapt to climate change are often considered to be expensive, and are seen as an additional burden on the economy. But European countries are already spending public and private funds on research, infrastructure, agriculture, energy, transport, urban development, social protection, health, and nature conservation. We can ensure that our existing expenditure on these areas favours climate-friendly and sustainable options that will help to create new jobs.